A few weeks ago I published a video I called A meditation. In the video I wanted to pay a tribute to the meditative aspects of spinning on a supported spindle. Spinning at the fulling mill. We shot the video at a 17th century industrial site in Dala-Floda, Sweden. The site consists of, among other things, a number of water mills by a creek. One of the mills is a fulling mill. Kvarna fulling mill at Dala-Floda, Sweden. A fulling mill (vadmalsstamp in Swedish) is a water mill that people use to full, or felt, their woolen cloth to make a sturdy and windproof felted material, used for wadmal clothing. Times were hard in Sweden once and wadmal clothing was the only thing that kept the wind and the cold out. The door out to the mill wheel. Photo by Dan Waltin. The typical cloth for fulling is a loosely woven woolen cloth. The cloth is carefully folded like an accordion and placed in a trough under the big fulling stocks. For the fulling to work you need to pour hot water on the cloth. The fulling stocks and the troughs. Isn’t this the perfect murder scene? Killed by fulling. photo by Dan Waltin. The water-driven mill wheel drives the stocks so that they beat the woven woolen cloth and thus full it. The trough is rounded in the bottom. In the front, the trough mirrors the shape of the stocks. This makes the cloth move around, thus allowing it to be evenly fulled. Fulling 6 kilos of cloth in the fulling mill takes around 6 hours. After the fulling is finished the cloth is carefully rolled up on rods to dry and re-rolled once a day until it is evenly dried. Behind the fulling stocks is the huge wooden milling mechanics. Photo by Dan Waltin. The fulling mill at Dala-Floda is one of just a handful of remaining and working fulling mills in Sweden. In the prime time of the industrial site in Dala-Floda the people in the area worked the mill Monday through Friday. Today it is only worked a couple of times a year as far as I understand it. There is also a working fulling mill at Skansen outdoor museum in Stockholm. Skansen outdoor museum in Stockholm has made a beautiful video where they show and explain how the Skansen fulling mill is used. Even though the video is in spoken Swedish, I think you will get the most of the meaning of how the mill works if your Swedish is a little rusty. The last minutes of the video shows how you can full your cloth with your feet in a basin in the comfort of your own home. Fulling your cloth at home will take about 12 hours. Why not let the whole family join in! Spinning by the fulling mill. Photo by an Waltin. I have a secret dream to one day spin a yarn, weave it, full it and sew a garment out of it. Even if I only get to full it by feet, what’s another 12 hours after a sheep-to-cloth process? I have written in earlier posts about my miniature-scale flax patch and how I grow, process and spin my own flax. This post is about flax processing at a whole different scale. This is the sixth and last post in my flax series. Earlier posts have covered flax processing in general, the 2018 harvest in my experimental flax patch, spinning flax on a spindle, flax processing and retting. Last year I wrote about the first harvests in my experimental flax patch and my first attempt at spinning flax on a wheel. This summer we rented a cottage in the Swedish countryside. The landlords are well aware of my textile interest. One day they came to the cottage and said that they had something to show me. I followed them into their kitchen and saw a giant piece of textile. It was a horse buggy cover. They had received it from a relative who was dying and who knew the cover would be well taken care of. The cover was woven from handspun flax from the relative’s in-law’s ancestors. I don’t have a picture of the whole cover, but picture this: A woven blanket the size to fit a two-seat horse buggy for the riders to sit on and perhaps also be covered by in cold weather, like a blanket. The cover is very densely woven in twill. It is constructed as a pillowcase, so that it can be filled with wool for the winter. The yarn is very fine and evenly spun. When we looked at the inside of the cover, we saw the difference in colour. The outside of the cover had been significantly bleached while the inside had kept its blue colour. Looking at the inside reveals the unbleached dye. So many questions arise when I look at this textile. Say the cover is at least about 150×200 cm, perhaps even more. And double it for the pillowcase construction. How much flax would you need to grow to weave something this size? How many farms or harvests? Did the people who made this cover have enough land of their own to sow all this flax? Were there more farms involved to grow the flax? Or did one family save flax for several year’s growth to process enough flax for the weave? Who were the people who spun and wove this cover? Was it only one spinner and weaver or were there more people involved? I have no information of when the cover was made, and we looked for some clues to the time period it could have been made. We looked at the seams and they seemed to be machine sewn, so the cover was probably made in the 20th century. Was this the regular horse buggy cover that people in general made for themselves for everyday use or was it a fancy cover, or perhaps a community horse buggy cover used for special community occasions? I talked to my friend Maria Neijman of Historical textiles and asked her if she could tell me anything more about the cover based on these photograph. She told me that the weaving technique seems to be warp-faced broken twill to make the cloth dense and durable. I asked if she could tell me anything about the dying. She said that the dark blue yarn in the stripes probably was dyed with indigo. The background colour was more difficult. She said that since the dye had bleached so badly, it may have been dyed with aniline, a synthetic dye. Some questions answered and many still unanswered. But at the same time it is nice to leave the blanket with its mysteries. Just being able to look at it and feel all the labour and love put into it makes my spinning heart skip a beat. This was the last post in my flax series. I hope you enjoyed it as much as I enjoyed writing it. As many of you know, I live in Stockholm. There are lots of antique stores, but no good flea markets. By good I mean flea markets where I can find textiles and textile tools. These kind of flea markets do exist, you just need to go to the countryside to find them. For the last five years we have rented a cabin at a sheep farm in the beginning of August. Not far from the farm there is a three storey flea market in an old spinning mill. Couldn’t be better. The market is open every Sunday all year round. Of course we made a day of it! So far I am disappointed in the range of textile tools, but there is one table at the flea market I can spend the whole day at. The sellers keep their table for as long as they rent them, so I know exactly where to go. My first stop is always the textile table. A woman collects textiles from around the countryside, not seldom from estates. Picture an old lady who once cherished her linen closet and filled it with hand woven gems. Picture the next generation unaware of the treasure hidden behind a squeaky cabinet door. The local super heroine, the Textile Lady, comes to the rescue and saves all the textiles from oblivion. The textile table at the flea market. Filled with old textiles that someone has cherished, another thrown away and a third has saved from extinction. The table is filled with sheets, towels, table cloths and lots of haberdashery (oh, how I love this word!). Bobbin lace, name bands, needles and every colour of buttons you can imagine. Flea market treasures – hooks, pins and sewing thread. The old packages are just exquisite. The pin box above right says “First class brass pins, solid heads”. Isn’t it to die for? Lace and name bands for every occasion. I stayed for a long while at the lace box, just taking in all the lace beauty and the hours upon hours of (women’s) work invested in them. I bought three embroidery hoops from the haberdashery corner (I just had to write this sweet word again!). The two bigger ones look like most embroidery hoops I have seen (see also featured image). But the smallest one is just so exquisitely made! The locking mechanism seems different and the inner hoop has a band meticulously wrapped around it. When I look at the label and the logo I’m thinking the 1020’s. My heart aches for all the sheets, towels and table cloths at the flea market and I want to rescue them all. I can’t, but we always end up buying more than we intended to. There is a lot of women’s history in these textiles, but also a story of industrialism and contemporary consumption patterns. When my parents got married in 1965 they got lots of household textiles for their new home – sheets, kitchen towels, table cloths etc. They still sleep on those sheets and dry their hands on those linen towels. If I should buy new sheets today, they would be threadbare in under a year. The pressure to buy more and new clothes every turn of the season has led to a pressure on the cotton industry. The cotton fibers are shorter to make way for more harvests. The yarn is more loosely spun and the sheets are woven at a wider sett to save fiber. We bought four old sheets at the market. Last year we bought six. These are wonderfully thick and strong, some of them hand woven. They will probably last longer than a lifetime. Look at the sheet below with the beautiful monogram. This sheet was made with love and pride. Probably also various amounts of blood, sweat and tears. However, the loom was too narrow to weave a whole sheet’s width. Thus, the sheet was woven in two lengths and joined in the middle. If you look closely, you can see a very fine seam between the letters in the monogram and above the crocheted lace. Just look at that join! Imagine the hours it took to sew it in bad lighting and sore eyes in a tiny country cottage. I sleep on these sheets with joy and the knowledge that someone has put their skill, love and hours and hours of work into my sleep comfort. Can you see the join of the two sheet halves? The sheets cost €4 each. While the Textile Lady has heroically saved the textiles, we bought the workings of another textile heroine. Someone had bought four hand woven fancy kitchen towels and joined them together with a crocheted lace ribbon. Such a smart and thrifty way to upcycle old textiles. In my textile rescuing frenzy, I bought five hand woven kitchen towels. Some of them were beautifully monogrammed. I put them away in the linen cabinet, but the other day I took them out again. My plan was to sew drawstring spindle bags. When I looked closer at them, I saw that they were woven in twill with a linen warp and cotton weft. Twill towels in linen warp and cotton weft. If you look closely, you can see it. The horizontal weft is matte while the vertical warp is shiny. I pulled out a warp thread and my theory was confirmed – long and shiny fibers. And then I realized that the linen thread was most likely handspun. You can see in the close-up above that the thread is not industrially even. You can also see some remaining cellulose from the flax processing. I bought the five towels for €15. Talk about unappreciated women’s labour. Now, however, they are greatly appreciated, by me. And I have turned them into beautiful drawstring bags, ready to host spindles and new yarn for future textiles. The circle is complete. The last thing we bought was an enamel washbasin. Actually, it was my husband who found it. ” I figured you would need this to wash yarn in!”. Indeed I did. This is a very typical kitchen utensil from the beginning of the last century by Kockums enamelware. They were very popular in the 1920’s and 1930’s but they stopped making them in the 1960’s. I have bought several Kockums utensils from Swedish e-bay – colanders, 5 and 10 deciliter measures and funnels. My favorites are the milk fetcher and the cream fetcher. The fetchers are lidded buckets to fetch the milk (2 l) and cream (5 dl) from the milk store in. We use the milk fetcher for compost and the cream fetcher for tea. Anyway, the washbasin is doing its job very well and when I don’t use it for soaking yarn in it is the proud home of my cards and combs. We also bought a potty for my husband’s niece who was born two months ago. What about the textile tools? Well, I looked for textile tools and found none. You might expect the odd scutching knife, flax hackle or weasel, but nothing. A couple of modern umbrella swifts and a the ugliest sewing table you have ever seen. Well, we’ll come again next year. Maybe we will save some more textiles or spot a whole range of flax processing tools, who knows! Embroidery is not my strongest textile technique. Sometimes, though, an embroidery just needs to exist, and this was such a time. I needed to do some serious logo embroidery on a wool handling apron. You may have noticed my logo, the sheep with the spiral fleece. My retired father used to work as an art director and has made lots of logos and I asked him to make one for me. He presented several different ideas, but I fell for this one. It was finished in March and I am very fond of it. Looking at it, I realized that it wouldn’t be very difficult to make an embroidery of it. I had the perfect wool for embroidery yarn – a strong and shiny white Rya. You have seen it in the Spinning around the world video I released in June. I spun it on a supported spindle and 2-plied it. 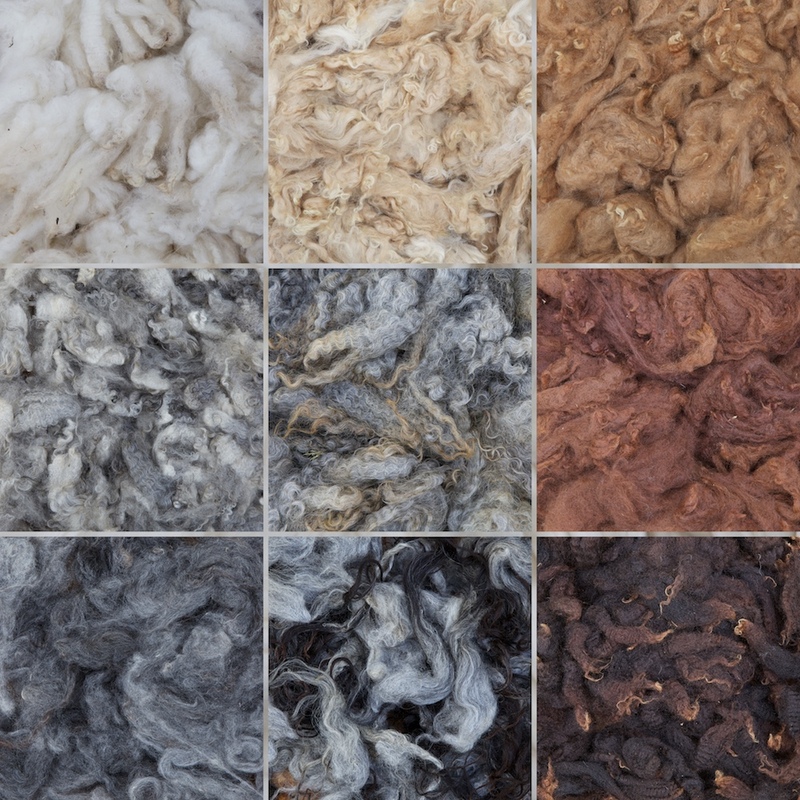 In this blog post you can read more about the wool and the spinning. The first step after spinning was getting the colour right. Dyeing is not my field of expertise, I dye when I need to. I use dyes from Greener Shades. I want to mix the colours myself, but I find it quite challenging. Sometimes I don’t see the colour until it’s all dyed. eventually I did get the colour right, but I dyed very little yarn, so it ended up very dark. On the second try I got it right. Newly dyed and dried. Rya embroidery yarn and wet felted undercoat for the head. Looking at the pictures now, though, I see that it has a bit too little red in it. I will have to live with that. I borrowed an embroidery hoop from my friend Maria (who helped me with my medieval spinning video). My original plan was to use a stem stitch – I thought it would look nice on the moving wool spiral. But the yarn was far too thick for the fine linen on the apron and it just looked like croquet hoops. So I picked it up and started again, this time with a simple backstitch. It didn’t make the yarn any thinner of course, but it was easier to make the curves of the spiral look better. The face was a bit tricky. Originally, I had planned to fill the face with embroidery, but then my friend Elaine suggested that I use a piece of felted wool instead. And that was av very good idea. The felted piece got a little thick, but I can live with that too. My father suggested beads for the eyes, which was just right. I love my new apron and I feel like a proud entrepreneur when I wear it.